The 2018 Mazda MX-5 RF (better known as the new “Miata” with the trick roof) will finally hit dealers across the nation by the end of this month. I’ve actually seen two of these little guys in the past week up here in the Pacific Northwest, and I have to say they’re quite attractive, especially when in motion. This also gives Miata, er, MX-5 fans something they have long been slavering for: a coupe option. 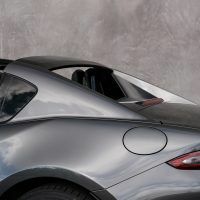 I never really understood this, but when I was living in San Francisco, the local roadster club I was in was obsessed with getting removable hardtops for their Miatas. It was the coolest thing you could do, style-wise. Here we were in an area of the world seemingly made for top-down sports car driving nine days out of ten, and what do guys want? Hardtops. 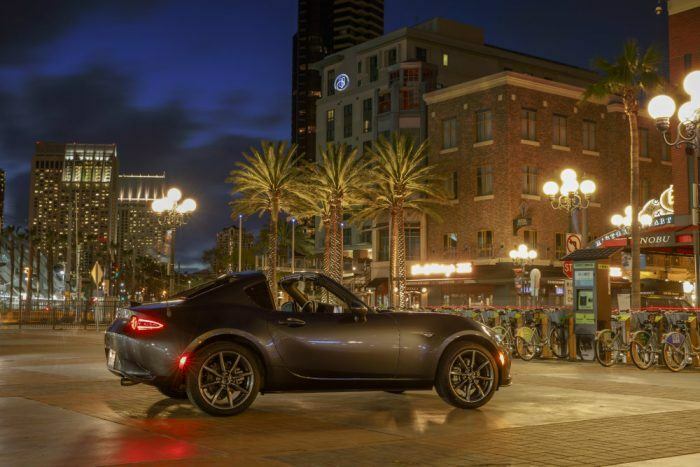 So, the current gen MX-5 RF should do great business in the Bay Area. With the top up, the RF has a classic, fastback style, and with the top “down” . . . well, okay, it’s doesn’t actually go all the way down, it does this Targa-like thing. Which is good. It looks nice, blows your hair around, lets you hear and smell what’s going on around you, but you know, sadly, not a full-blown convertible. At any rate, here we are in Chicago, The Windy City, City of The Big Shoulders, Hog Butcher to The World for the Chicago Auto Show, and this is where Mazda announces the pricing and packaging for the 2018 MX-5 RF. This follows, since the Chicago Show was where the first Miata debuted in 1989 (feeling old yet?). This is the second year of production for the MX-5 RF, which stands for retractable fastback, and for this go-round, all MX-5s receive some noteworthy upgrades. For example, we have the newly standard heated cloth seats in MX-5 Club. As a guy who is currently looking for a good interior shop to install aftermarket seat heaters in his 1994 R-Package, I can only see this as a good and sacred thing. Advanced Keyless Entry comes standard on all models, along with new color options and leather-trimmed seats (also heated) as part of the Brembo/BBS Package. Both the Club and Grand Touring versions come with standard LED headlights, various infotainment technologies, and a nifty seven-inch display. 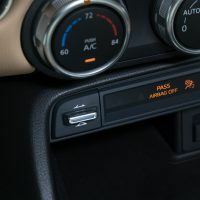 There are two USB inputs, a Bose nine-speaker audio system, SiriusXM satellite radio, and plenty of safety features like blind spot detection. And all that is nice and fine and true, but believe me, when you start to wring out a little sports car like this on a winding road, all that stuff falls away from “what is needed.” And “what is needed” a Miata has in droves. All new Miatas, er, MX-5s, come with a fast to redline SKYACTIV-G 2.0-liter engine that sends 155 horsepower to the rear wheels via a standard 6-speed manual transmission. And given that these things weigh in at, what, 2,200 lbs, that’s enough motive power. There is an available 6-speed automatic that people say is actually pretty good. It has those slick flappy paddles and all that, but I haven’t driven one yet, so don’t ask me if the auto-box is a good option. 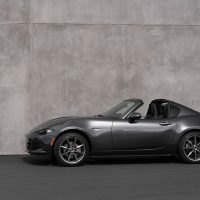 If minimalist performance is not your thing, then perhaps I can interest you in the more luxurious MX-5 Grand Touring. The Grand Touring comes with body-color exterior mirrors, automatic on/off headlights, rain-sensing wipers, automatic climate control, heated leather seats (naturally), navigation, an Adaptive Front-lighting System with High Beam Control, and a Lane-Departure Warning system. For 2018, Auburn Nappa leather is available fine sir. The 2018 Mazda MX-5 RF starts around $25,000, topping out in the mid-to-high $30,000 range. And dollar for dollar, they are very hard cars to argue with. You can see them on display at the 2018 Chicago Auto Show now through the 19th at the McCormick Place in Chicago, Illinois. Tony Borroz has spent his entire life racing antique and sports cars. He is the author of Bricks & Bones: The Endearing Legacy and Nitty-Gritty Phenomenon of The Indy 500, available in paperback or Kindle format. Photos & Source: Mazda North American Operations.